A recent denial overturned by Prudential illustrates the value of having an attorney manage your claim for you in the long run. Since March 31, 2012, Ms. V has been unable to perform the material and substantial duties of her regular occupation or any occupation. Benefits were initially paid to Ms. V due to her debilitating pain; however, almost immediately, Prudential began its attempts to categorize Ms. V’s claim in some way to limit its liability under the policy. In 2013 Prudential sent a letter to Ms. V with policy language explaining that her claim could end at the 24 month mark. The letter seemed to imply that Ms. V’s claim could be subject to the 24-month mental illness limitation in her policy. Up until that point, neither Ms. V nor her doctors had indicated that Ms. V was disabled by any mental health condition. Despite this fact, Prudential found it appropriate to have Ms. V undergo a psychological evaluation. While Prudential also requested a file review by a doctor in neurology, it did not request a physical evaluation of Ms. V despite her suffering debilitating physical pain. Ms. V came to us in 2014 for assistance with fighting Prudential. At the time, her claim was being paid but Prudential insisted that her claim, although based on functional deficits caused by physically disabling medical conditions, was subject to the Plan’s 24-month mental nervous limitation. In January 2015 Prudential provided notification of its decision to terminate Ms. V’s claim under the mental health limitation of her policy relying on statements from its hired psychologist, Dr. Richard Gelb that there appears to be the presence of a possible Conversion Disorder (Conversion disorder is a condition in which you show psychological stress in physical ways). An appeal was prepared by this office which included substantial evidence that Ms. V’s condition is adequately explained by the diagnosis of Complex Regional Pain Syndrome (CRPS), a condition which had been diagnosed but had been, up until that point, completely ignored by Prudential and its hired physicians. The appeal included a valid Functional Capacity Evaluation and several supportive statements from doctors. Additionally, the appeal included a very detailed pain journal. After a long appeals process, our office was successful in getting her claim reinstated based on her primary disabling condition of Complex Regional Pain Syndrome (CRPS). See this article. Since then, our client’s condition has not improved and she has had numerous hospital visits, each time seeing new physicians who struggle to fully understand her often misunderstood medical condition. Although her medical records continue to document her many disabling symptoms it seems Prudential does not want to continue paying her claim. At only 45 years old, there is nothing to suggest that our client’s condition is expected to improve at any point in the near future and Prudential could be on the hook for another 20 years of benefits if doctors don’t find a way to effectively treat our client’s misunderstood medical condition. However, Prudential never stops looking for a way to limit its liability on this claim. In August 2017 Prudential sent a letter to our office with notification that it had scheduled another “independent” evaluation by none other than Dr. Richard Gelb. In the same letter Prudential quoted policy language regarding its right to require such examinations and that refusal to be examined could result in denial or termination of the claim. Attorney Peña responded with a letter requesting an explanation on why Prudential was requesting the same evaluation with the same doctor that supported the previously overturned denial of benefits. A request was also made for a videographer to be present and a demand that Prudential schedule an appointment with a doctor of the correct medical specialty if an examination was truly necessary. Naturally, the request for a videographer was denied. So as not to give Prudential an easy way to deny the claim Ms. V attended the neuropsychological evaluation administered again by Dr. Gelb. During the evaluation, Ms. V had a flare up of her condition and suffered extreme swelling in her extremities. Her hands became purple from the simple task of filling out doctor forms. Unsurprisingly, Dr. Gelb’s report failed to include an adequate description of Ms. V’s symptomology. However, at Attorney Peña’s request, Ms. V’s family was able to document the symptoms with date stamped pictures on their phones. As if Prudential had completely forgotten about its previously overturned decision years prior, Prudential sent notification in December 2017 that it was terminating Ms. V’s claim based on Dr. Gelb’s opinion which almost mirrored his opinion written years prior. 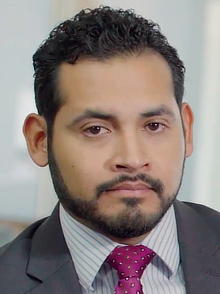 Attorney Peña and his team began immediately working to tear apart Prudential’s obvious attempt to reclassify Ms. V’s condition as a mental health condition. The appeal included pictures documenting Ms. V’s symptoms the day of Dr. Gelb’s evaluation. Attorney Peña also demanded that Prudential set up an evaluation by a doctor previously used by Prudential who supported Ms. V’s claim years before. After all, it would only be fair since Prudential found it reasonable to utilize the same doctor it had relied on in the past who had supported the previous denial of benefits. At the very least, Prudential should schedule an evaluation with a doctor who specialized in pain medicine. Shortly after the request was made, Prudential notified our office that an independent medical evaluation would be scheduled with a pain specialist and the doctor would comply with our request that a videographer be present to record the evaluation. The video was submitted to Prudential to ensure it became part of the administrative record. Also submitted to prudential were photos documenting Ms. V’s symptoms and medical records from an urgent care visit that was necessary following the evaluation as a result of the stress put on Ms. V’s body. The appeal demanded immediate reinstatement of Ms. V’s claim and that Prudential should abstain from performing anymore unnecessary evaluations by doctors who are not of the appropriate medical specialty. Shortly after, our office received a long letter from Prudential outlining their decision to reinstate Ms. V’s disability claim. This claim is a perfect example of how insurance companies never rest in trying to limit their liability on a claim. Prudential had no shame attempting to use exactly the same reason and exactly the same doctor as it used to deny the claim before. It seems that Prudential was hoping that Ms. V would give up fighting, which is what many claimant do in her position. If you have a similar claim against Prudential please do not hesitate to contact our office for a free consultation.